CELEBRATE: The William Zachary Reparations Protest! Kansas Black Foot Soldiers Praise Tulsa Soldiers, Condemn Zachary’s "piggish life, racial terrorism & Holocaust denial." “We condemn the Holocaust denial of this city and county’s whites and the violence they present us with when our claims for reparations are staked. The criminals are the whites who deny our claims. Because, until the United States government addresses reparations from the top down, we have right and will continue to pursue them from the bottom up. “WHAT DO YOU THINK ABOUT IT NOW, BILL? WHAT DO YOU THINK ABOUT IT? IS IT IMPORTANT YOUR FAMILY DIDN’T OWN SLAVES? SHOULD WE GET OVER IT? “WHAT DO YOU THINK ABOUT IT NOW?” (SEE:) The William Zachary Reparations Protest; Alleged DARING Tulsa Reparations Protesters DeAndre Wright, Montre Brown, Uriah Mitchell, Marquis Powell & Darelle Johnson Apparently Forced to Defend Selves in COURAGEOUS Campaign Against Generational Racial Terrorist; Tulsa County Black Foot Soldiers Hail Reparations Protesters: ‘Heroes!’ (UPDATE:) Did Divine Racial Karma Want “Girlfriend” Sandra Lee Raped & Killed? “For, reparations offender Bill Zachary just met our peaceful pursuit for justice from the bottom up and, through his assaulting Holocaust denial and racist violence – just like the pig he was presumed to be, he valued his ill gained possessions over his morally degenerate life. The William Zachary Reparations Protest; Alleged DARING Tulsa Reparations Protesters DeAndre Wright, Montre Brown, Uriah Mitchell, Marquis Powell & Darelle Johnson Apparently Forced to Defend Selves in COURAGEOUS Campaign Against Generational Racial Terrorist; Tulsa County Black Foot Soldiers Hail Reparations Protesters: ‘Heroes!’ (UPDATE:) Did Divine Racial Karma Want "Girlfriend" Sandra Lee Raped & Killed? “YOU HAVE OUR MONEY! OPEN UP THE SAFE!” – Daring protesters allegedly claimed. 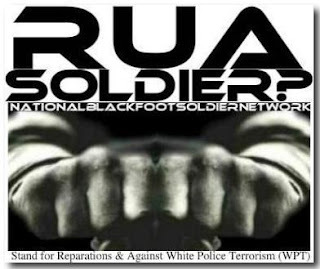 Tulsa County Black Foot Soldiers have reportedly issued a statement condemning the alleged Holocaust denial and violence of reparations offender William Zachary and the arrests of alleged reparations protesters Uriah Mitchell, Montre Brown, Marquis Powell, Darrelle Johnson and DeAndre Wright. “We have right to claim our reparations at whites’ houses, for their cars and for their wallets and purses; and, will continue our peaceful protests for reparations.